The NAP Final for District 1 (West) will be held on Sunday, Oct. 14 at the Mirage Bridge Club at 10:30 am. This final has two consecutive sessions during this day, with a lunch break between the two. 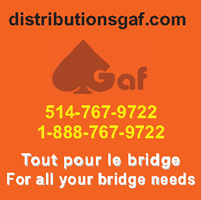 Invitation to all members of the Montreal Bridge League (Unit 151), on September 2018. There will be a light snack for attendees. Non-members are also welcome. New Laws of Duplicate Bridge 2017 The Laws of Duplicate Bridge 2017 are effective in the ACBL beginning September 25, 2017. Below is a synopsis of changes made from the previous (2008) version of the Laws.